So here are 3 plants. 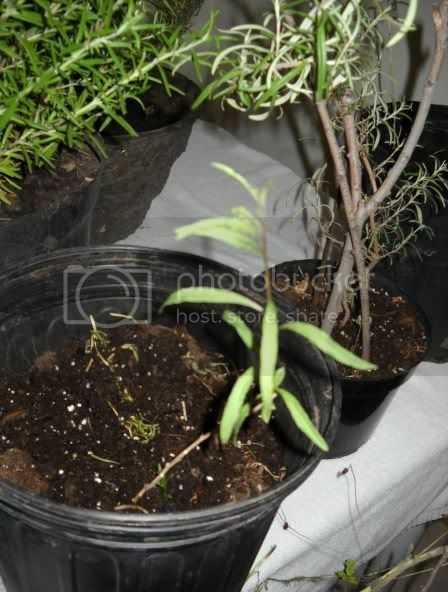 The left is a rosemary the one in the middle is a Wolfberry and the right is a Rosemary from Seed @ 9 months approx. Rosemary stacked on sage. Very similar plants tbh. You get the best deals on rosemary at the end of the season !! Rosemary is a really cheap herb as someone said its a weed!! Keep pretending it is so I can get more insane clearance deals. I once again have rosemary that I started from seed early this spring, which is now doing very well outside. about rosemary bonsai, where he says rosemary if brought indoors likes it cooler than normal house temps. It made me think-- I have a screened in porch. It is open but protected from wind and I can put pots right next to the house wall, where maybe they would get a bit of leaked heat. Is it possible they would survive the winter there? If I bundled it in straw or something? Probably not, huh? By cooler, he probably didn't mean freezing. How about the coat closet that is in the airlock entrance, next to the front door, if I put a light in there? That gets cold, probably down in the 50's, but not freezing. Trick would be not to forget it was there, since I would never see it! Just thinking... I've killed two rosemary plants bringing them in for the winter. It would be really nice not to do it again. I got mine through the winter with milk sprays, but just barely and it took some time to recover. I have kept a smaller one (now my larger one) in the airlock on a shelf that got colder than fifty, you betcha, and it did fine. My rosemary plant is now 3 years old and going strong. It is planted in the ground with the other herbs I'm growing. 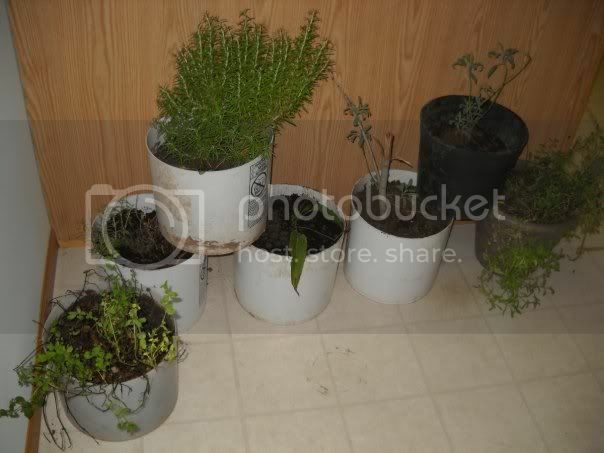 I have oregano, chives, sweet basil, mint and thyme right now. I'm thinking of moving the mint to another area and box it in since it is so quick spreading. 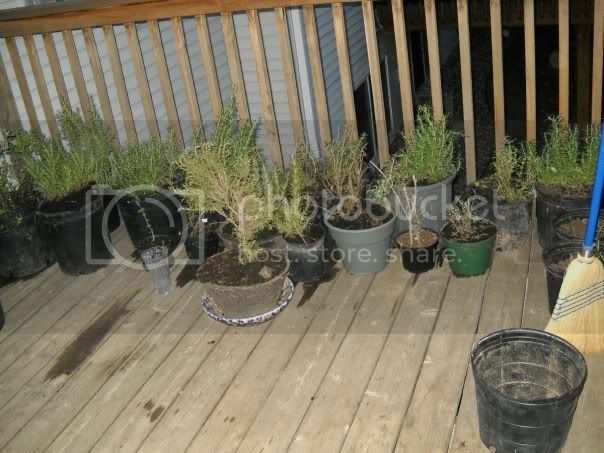 The rosemary plant is huge even though it does get cut back drastically a couple times a year just to keep it in check. I'll give lots of it away, use some in cleaned salad dressing bottles with sprigs of rosemary and filled with vinegar for a nicely flavored alternative to plain and balsamic varieties. There is nothing like cooking with fresh herbs to really waken the palate and make your kitchen "stink pretty". Agree with HG Just want to be sure people don't miss it that Gumbo (as you might guess from the name) IS in New Orleans. What works in New Orleans does NOT work in much of the rest of the country! rainbowgardener wrote: Agree with HG Just want to be sure people don't miss it that Gumbo (as you might guess from the name) IS in New Orleans. What works in New Orleans does NOT work in much of the rest of the country! Funny, I also belong to a motorcycle newsgroup since I've been riding those things for over 40 years and it is also one of my life's passions. The folks that live in more northern climes tend to hate me when I write about taking long day rides in the country in December and only needing a jacket to be comfortable. Meanwhile, they are up to their chins in snow and ice with no end in sight for several more months. But, that comes with a price, and summers here are brutal and make gardening a real chore. I know I am blessed with milder weather over the winter months and do take advantage of it as much as possible. I can garden year round and have had some of the best tomato crops in the fall/winter since pests that ravage the plants in the summer are virtually non existent when the weather cools. Yep So let's all gloat about our upper 80's and low 90's weather and the luscious tomatoes, juicy peppers, and cool cucumbers that are just entering peak production right now to gumbo while we can ! AS, you've got me there. My tomatoes are all pulled and in the compost pile for at least 2 weeks now, peppers and eggplants are struggling in this heat but are showing signs of making a bit of a comeback. I'm picking 4-6 cucumbers a day from my smaller trellis and okra is really picking up with close to 50 pods a day right now. My second round of green beans are just reaching the bottom of the larger trellis for a fall harvest. My once lush green garden is about 2/3 empty waiting for some cooler temps. for the leafy stuff. Besides, that little tropical thing in the Gulf of Mexico is fixing to dump some heavy rains on southeast La. over the next couple of days---so they say. Thought about melons or something that likes all that heat, Gumbo? I've got about 1000 sq. ft. of garden and the last time I had melons, they took up lots of space that I would rather use for my vegetables that I use almost daily. With cooler temps on the way, I'm looking at lettuces, spinach, chard, collards, turnip greens, more tomatoes, broccoli and brussel sprouts to name a few. Also any holdovers from the summer garden till they cease production. I can get 20 lb. seedless watermelons at the local supermarket for around $4 each. Cantaloupes are running about $1.50 each on sale and large seeded melons are around $5-6 each.